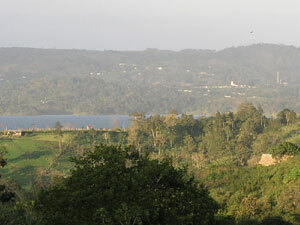 Nuevo Arenal across the lake. 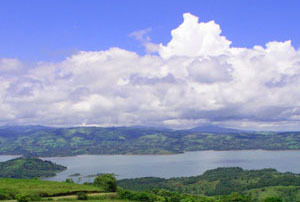 El Roble, also known as Chimurria, is located on the south side of the lake uphill from the paved road between San Luis and Tronadora. It is a quiet village with a single lane and great views over the lake and mountains. Several North Americans have bought and remodeled Tico homes here. As placid as can be, it yet is only 10 minutes from the town of Tilaran and less than 1 1/2 hours from the Liberia airport. 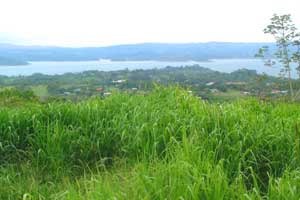 L6 1+ acre with beautiful view in El Roble - $109,500. Tronadora lies below the eastern side of the hillside, one-lane village of El Roble. 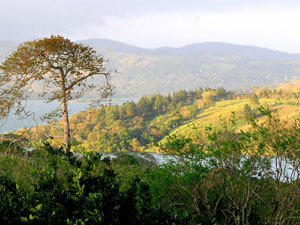 El Roble lies among the hills and peninsulas seen from the north side of the lake.